New Horizons Band is a non-auditioned performance ensemble for adults age 50 and over. 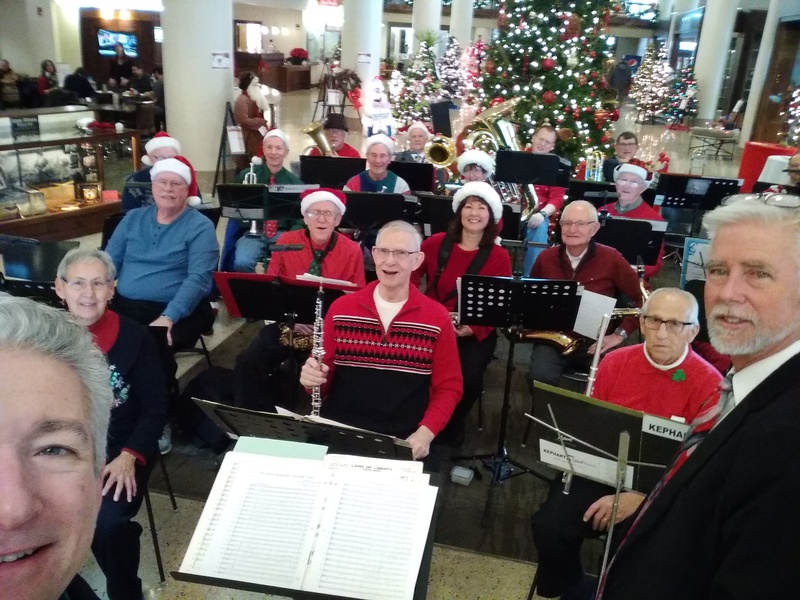 Members get to be part of a band, play favorite melodies and exciting band arrangements, meet new people who share a love of music, and have a weekly outing that promotes good health, relaxation, and fun! Directed by Glenn Pohland, our New Horizons Band gives a variety of public performances. The school's New Horizon Band was formed in 2009 and is a part of the international organization New Horizons Music (see below for more info). If you already play a band instrument, join today! Need beginner or refresher lessons? It's never too late to learn to play an instrument or read music! Those in need of beginner or refresher lessons can set up instruction through Northeast Iowa School of Music. When you are ready, join the band! New Horizons Band was recently featured on KCRG. Sign up today! To join, simply submit a New Horizons Band registration form with payment to Northeast Iowa School of Music. Each semester is only $30 to participate. Returning members who played in the past year do not need to fill out a new registration form and can bring payment to the first rehearsal. Contact the school at (563) 690-0151 with questions. What is New Horizons Music? Our school's New Horizons Band is part of the international organization New Horizons Music. This group is living proof that, when it comes to learning to play a musical instrument, it truly is “never too late.” Many band members, who must be at least 50 years old, started taking music lessons only after passing their half-century birthday. Yet the New Horizons Music concept, the result of a groundbreaking music course at the University of Rochester’s (NY) Eastman School of Music, has become a popular performing ensemble in communities across the U.S., enticing amateur musicians ranging in age from their early fifties to mid-eighties. Recent studies have determined that adults over 50 are the fastest growing segment of the population, and music and wellness in older adults is an increasingly popular area of study. Programs such as New Horizons Band provide mental and social stimulation, stress relief, and a number of other potential health benefits. Older adults have the time and motivation necessary to develop musical skills rapidly. In addition, performing music—especially in large groups—can improve health and quality of life.